This interview took place on: 12/10/14. JFH (Michael Weaver): First off, it's great to have Sullivan back together! What led to the talks that eventually got you guys back together and into the studio after 7 years? Brooks Paschal: The songs! I wrote "Profile" and sent a little demo to the guys. I was like, "Doesn't this sound like a Sullivan song?" All the dudes agreed and off we went. JFH (Michael): What was the recording process like this time around? Was it like entering the studio with your brothers and you never missed a beat, or did you guys have to feel each other out a bit after such a long period of time? Brooks: Totally different, we made the album ourselves. A lot of remote recording and bouncing back and forth ideas. Tyson flew in and we worked for a week at my studio. I mixed the album over the next six months; it was very unorthodox. JFH (Michael): You guys obviously have a history with John Frazier at Spartan Records, but I think many fans just assumed you would go back to Tooth and Nail. One would think that Brandon Ebel would've have loved to get you guys back in the fold. In the end, why did you go with the relatively unknown, but certainly up-and-coming, Spartan? Brooks: Well, we signed to Spartan before the album was finished. I have always sent stuff to John for his feedback. I like his style. Truthfully, we had no expectations for the album. We were flattered Spartan wanted to be a part of it. JFH (Michael): When I initially heard the first few seconds of "What's Good For the King," I thought, "Wow, that sounds very Beatles!" Are you guys big fans, or was that vibe entirely coincidental? Brooks: I am! I usually pick up on things like that, but honestly I don't hear it. There is probably a song out there of theirs that I haven't heard that is similar, so it makes sense. They basically wrote all the good songs first. JFH (Michael): Speaking of that song. It's actually a pretty tragic tale. There's a mother on pills, an absent father, and a house that burns down. Is this a true story, or just a work of fiction you came up with for a great song? Brooks: The story itself is totally fiction, but the scenery is loosely based on a house of a relative I used to stay with. I really wanted to paint the picture of smalltown America. It was probably the hardest song I've ever written as far as detail goes. JFH (Michael): I personally feel the album is very deep and many songs are open to interpretation. I could literally sit here and ask you what each song is about and be completely enthralled, but that could lead to a pretty boring interview for some. I am, however, extremely interested in "Melanoma Lullaby" and "Statuette." "Melanoma Lullaby" is my favorite song from the album and appears deeply personal. "Statuette" is just a fun and fast-paced rock song, but it seems - and maybe I'm way off base -- a little serial killer-ish. I mean, that theme would kinda match up with the album cover... What's the story? Brooks: You are right on both accounts. "Melanoma" was the last song written on the album, and I recorded and mixed it on my laptop while working in Florida. It was just one of those songs that happened. The overall idea was to write a song that sounded innocent enough but took a turn at the most unlikely place. It's really a conversation with death, and how you might reflect on things if faced with it. "Statuette" was a prototypical Sullivan song, angry and mischievous. I wanted it to be a lot of fun, with a lot of evil mixed in. Yeah, it's basically based a person with an addiction, and we will never know if he succumbs to it, but he has some big plans! JFH (Michael): Heavy is the Head sounds a little more cohesive, and honestly just better in all aspects, than your first two albums. That's not to be taken as a knock on your previous work, but as a compliment to your growth. What would you attribute that growth to? Brooks: Time. We didn't stop making music, we just stopped making it together. We really figured out what we were good at, and we allowed ourselves to make an album with a natural progression. JFH (Michael): So you've released your first album in 7 years... What are the tour plans? Fans are definitely going to want to see you guys and hear this album, as well as their old favorites, live. I'd personally love to see a bill featuring Sullivan and labelmates Young Fox. Brooks: We will be out and about, there are a few things in the works. Touring is in our blood for sure. JFH (Michael): Since Christmas is right around the corner, I have to ask… What's on top of your Christmas list this season? Brooks: Some nerdy audio gear. I'm a producer/songwriter by day, so I'm always looking to expand my studio. JFH (Michael): I want to close out by wishing everyone in the Sullivan camp an awesome and very merry Christmas. Any closing thoughts, or information, you'd like to leave our readers with? Brooks: Well first off, thank you very much. Being able to do things like this again means a lot to us. You take it for granted until you aren't in it anymore, so this is a very cool thing. Secondly, BUY OUR ALBUM!! (iTunes) In today's music market, it actually doesn't take a lot to make a splash. If we can perpetuate a little rock 'n roll in the world, then I would feel like we have all made a difference for future music lovers. 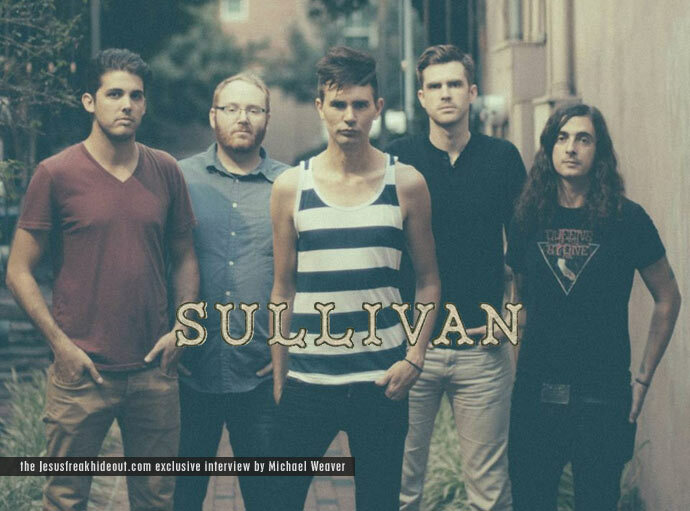 Sullivan's latest album, Heavy Is The Head is available now wherever music is sold!